On the first Friday of June 2015, we are having breakfast with Romance Author Miranda King. 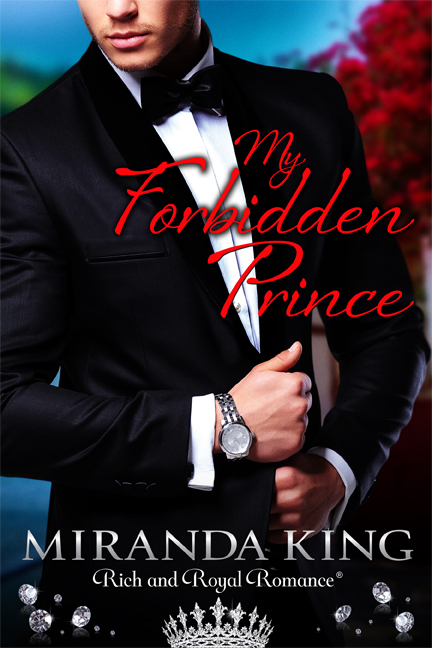 Miranda is a scriptwriter-turned-author, debuting her first book Almost My Prince. She loves to write about heroines who go on life-changing adventures, particularly those involving European kingdoms and royalty. Her novel, Almost My Prince, is part of the True Royalty book series. For this April breakfast, I was going to have my new usual: organogold coffee and the results of my lettuce thinning with an alpine strawberry, but … Miranda, you wanted to say something? You have to come with me, Michelle, for our virtual breakfast spot on the third landing of the Eiffel Tower. There we’ll find Gustave Eiffel’s private apartment, newly opened to the public. We’ll feast in the Victorian-style parlor, decorated in paisley and burgundy accents, with our crepes sneaked in from La Bonbonnière de Marie, a quaint café nestled within the famous monument’s gardens. But we’ll have to save room for Parisian macarons from Le Jules Verne restaurant on the second landing on our way down from the Eiffel Tower. I’m in! Okay, just had my first bite of the crepe and ooh la la! And don’t touch my lavender macaron. Back to our writerly conversation … Tell us about your writing process from concept to draft to revision. After law school, I went back to UCLA for their graduate film program to learn script writing. With that background, I have logical plot structure hardwired into my brain—I should by training write more like a plotter than a pantser. Nope. I’m more of a fly-by-the-seat-of-your-pants writer. Sort of. I can’t write a story unless I can visualize its movie trailer, which includes the conflict setup and major set pieces, or scenes. I’ll scribble handwritten notes on one sheet of paper, and that’s all I have as my guide through the story. Although, I constantly refer to that one sheet of paper throughout the writing process—and by the end, that paper is so tattered that even a forensics investigator would have trouble figuring out my original notes! I admire authors who write high daily word counts of well over two thousand or more. That’s not me. I labor over every word in my initial draft, and I don’t move on from a chapter until I feel it’s 99% done. I then have my final draft where I focus on rechecking my grammar, word choices, etc. But since I’m such a perfectionist, I toy with minor tweaks up until the very end of a deadline—even then, I’m still pining to fix things. For instance, I used the word “intimate” instead of “intimidate” in the book. How could all the proofreaders and myself have missed that? Those words have vastly different meanings, which adds a level of hilarity to that passage not intended there. I’m hoping that I’ll reach a point where I can laugh when I read it… someday, that is. I use a beat sheet myself – thank God for scriptwriters who showed us fiction writers the way. And I break out into a cold sweat when I see an error in one of my books. Once caught the heroine who swan across the pool on my final, 23rd read-through. Tell us about your novel while I top off your Parisian coffee. What did you find fun/intriguing about writing Almost My Prince and what was difficult? This book was never meant to be. Then a trademark deadline came along. Part of the trademark registration process for my tagline Rich and Royal Romance® required that I publish a book using that phrase before a certain deadline. Unfortunately, I didn’t fully realize this until about six weeks before that deadline, which meant I had to write, format, publish, and deliver the book to the trademark office by that preset date. I scrambled to find a book cover artist, formatter, and two editors. After factoring in the time they needed on their end, I had less than a month to write a book. Yikes! I had to focus. Repeat: Focus. Despite my deliberate distraction, temptation: Integrity Toys, makers of the Fashion Royalty* line of dolls I collect, was hosting its annual doll convention in Florida—only the best event of the year! All my friends were going, and I had to miss it because I had “homework”—a book to write. 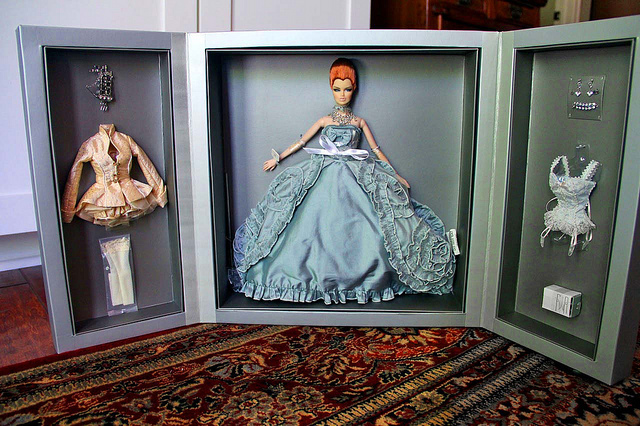 Now these 12-inch Fashion Royalty dolls are works of art unlike anything you’ve ever seen. They have masterfully sculpted faces, ultra-fab hair, and exquisitely tailored outfits. Doll collectors travel from all over the world to see the “reveal” of Integrity’s new edition of dolls. Even Jason Wu, the famous fashion designer, would be there. Where was I? Sitting in front of my blank Word document. When I should’ve been writing, I was texting friends about the latest fashion reveals at the convention I was missing. Since my brain wouldn’t shut down from all the convention excitement, I found a creative outlet—I incorporated Fashion Royalty dolls into the book by depicting my heroine as a fashion doll designer. Combine that with a recent trip to the South of France—and the book was born. Tell us about the True Royalty Books. Why this series, why now? You want to know a secret? I HATE cliffhangers. Yet Almost My Prince has what I’d call a “soft” one. That’s because I’d planned eight more chapters that didn’t make it into the book. As it was, I pulled more all-nighters than I ever had in college, and I averaged four hours of sleep so I could make that trademark deadline haunting me. Finally, the editor called “time” on me and allowed me exactly one hour to end the book or she wouldn’t have time to edit those last pages. Every nerve in my body revved up and my hands hit the keyboard. That last hour was a typing frenzy and I questioned if it would result in gibberish. Yet, looking back at it now, I don’t think I could’ve written that ending any better, even if the editor had given me another day instead of a mere hour. That ending also opened the door in my imagination to the other characters’ stories. Characters that lived and breathed for me, gave their all for this story, and now demanded their own happy endings. So one book spawned into a family saga of stories. Prince Michael, Princess Divina, and their brother Prince Rylan all have adventures in the works. I labeled this family saga “True Royalty” in honor of the Fashion Royalty doll* True Royalty Vanessa. This particular doll is dressed in the French Rococo style, preceding the French Revolution. The tumultuous French history surrounding that era caused me to think about the conflict between destiny and the choices we make. Now in modern times, each member of the ruling Diamond family of Maravista must embrace their royal heritage yet live with the choices they make that come into conflict with that. True Royalty Vanessa for me symbolizes that struggle. It’s a struggle I think we all face to a certain extent. Okay, well, maybe not the royal part. But we all have a heritage based on our parents. For most of us, those are the parents who raised us, but not necessarily. Since we carry the same DNA as our ancestors, are we prewired to make similar choices about our lives, our professions, etc.? If so, perhaps it’s because we inherit our ancestors’ skillsets and tendencies. My family descends from a long line of doctors, and even though no one pushed my father into the medical profession, he said that there was something deep inside him, some yearning, that wouldn’t rest until he’d achieved becoming a doctor. I felt the same pull, yet I chose a different path—and it was an internal battle. To some extent, it still is. So it caused me to question: Is there a born instinct, a genetic destiny apart from social conditioning, we have to fight against in order to carve out a different future for ourselves compared to others in our family? Something to think about. Each book in the True Royalty series explores different facets of that question. A handful of readers email me that same question every day. Since I’ve written Almost My Prince, I’ve been juggling script projects with prior commitments. Thankfully those are coming to an end, and I’ll have my full focus on Book 2 of the True Royalty series, My Forbidden Prince. I anticipate this book will release in late summer/early fall. I’m excited to finish Christian and Sass’ story—the hints I left in the first book resurface in the next book as stunning surprises and satisfying answers. I bought Almost My Prince a few weeks ago. I love the voice of this book. I highly recommend the book to anyone who likes a fun romance and characters with attitude! Thank you for visiting with us, Miranda. I’m looking forward to the release of the second book. Let me pour us all another virtual cup of Paris. *Fashion Royalty doll photos courtesy of Rich Benson. This entry was posted in Food, WRITING and tagged Almost My Prince, author, breakfast, Eiffel Tower, Fashion Royalty doll, France, Gustave Eiffel, La Bonbonnière de Marie, MIRANDA KING, My Forbidden Prince, paris, Romance, True Royalty. Bookmark the permalink. Excellent blog. Love the idea of breakfast on the E. Tower. The Eiffel Tower seems to be mentioned much lately! This was a fun interview. Picturing the story like a trailer for a movie is a great idea. I might have to steal it. Not only is Miranda a wonderful story teller/writer…she’s an awesome person with the soul of a saint!